VERY IMPORTANT – YOU MUST “CONFIRM” TO GET YOUR FREE GUIDE! Thank you for signing up for our guide. To get the download of the guide, we need you to confirm your email address.A confirmation message has been sent to you with a link you must click on in order to begin to receive the information.Open your email inbox and look for a message from contact [at] icloudlogin.com with the subject “Please confirm your request for our guide : iCloud – 10 Essential Tips”. 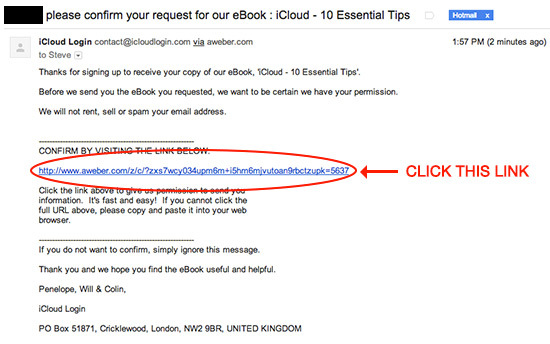 If you don’t, you will not receive the ‘iCloud – 10 Essential Tips’ guide, nor any future tips, and the help and information that you’ve signed up for!If you are a Gmail user, you might find that our email has been automatically put in Gmail’s ‘Promotions’ or ‘Updates’ tabs. So, if you’re wondering where the email is, look in those tabs. If our email is in there, we recommend that you move it to your ‘Primary’ tab so that you receive any future emails. While you’re waiting for that confirmation email, you should follow us on our Facebook page, Twitter and Google+ page to get all the latest tips and news. Click the icons below.